Air temperatures dropped to an average of about 25-32 degrees on at least two nights over the last few days. Understandably, some wheat producers are concerned that these temperatures may have caused some damage to their crop. We will have to see what happens over the next few days. Based on information coming out of a Kansas State University publication http://www.bookstore.ksre.ksu.edu/pubs/c646.pdf, at our current growth stage, between Feekes 9 and 10, in northern counties and between heading and flowering in southern Ohio, the yield effect of frost can range from moderate to very severe if temperatures drop to 24 - 28° F for two or more hours. It all depends on the growth stage, how cold it was, and the length of time plants were exposed to the cold temperatures. The amount of damage is a function of both time of exposure and the temperature, but we are unsure how modern wheat varieties growing under conditions in Ohio will react. For example, 28 degrees for 30 minutes may be as bad as 31 degrees for a long period. We are currently in the second year of a three year study to evaluate wheat freeze damage in modern soft red winter wheat cultivars. Freezing temperatures between boot and flowering may cause leaf discoloration, spikes to be trapped in boot, floret sterility, and damage to the lower stems. Bent heads may also be the result of rapid growth with warm temperatures followed by slower growth with low temperatures as we observed bent heads prior to freezing temperatures. The damage tends to be most severe with the greatest yield impact between heading and flowering. The head has some protection from cold temperatures until it emerges, but is easily damaged after emergence. Sterility and stem damage may lead to yield loss, however, since it is highly unlikely that all the plants in a field were at the same growth stage and were equally exposed to temperatures below 30° F, the overall damage may be minimal and restricted to low areas of the field. At most there may be some leaf tip burn on more sensitive varieties. Wheat is a winter crop and can tolerate cold temperatures. To determine if your wheat has suffered freeze injury, walk the field and observe leaves and stems for discolorations and deformations. Between Feekes 6 and 8, leaves and stems on freeze-damaged plants become twisted and turn light green or yellow, with necrosis (darkening) of the leaf tips (Figure 1). These symptoms usually appear about two to three days after freezing. 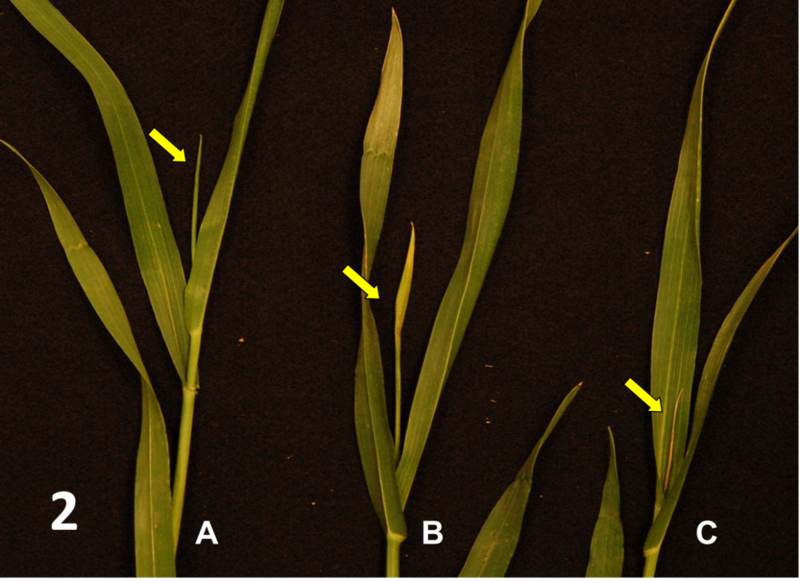 At Feekes 8, the emerging flag leaf appears yellow (Figure 2B) or necrotic (Figure 2C) instead of healthy green (Figure 2A), indicating that the growing point is damaged or killed. 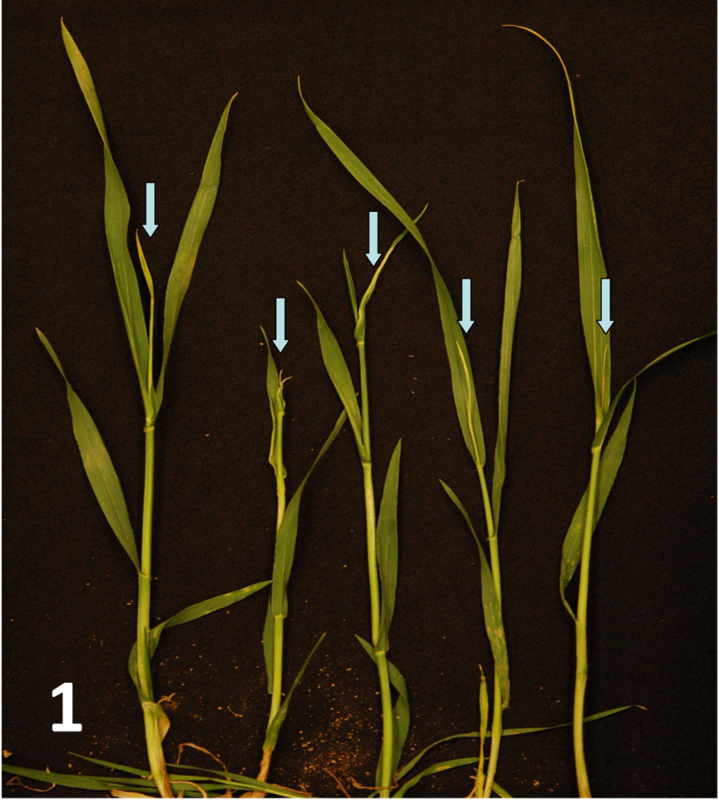 Secondary, unaffected tillers will develop and produce grain, but tillers with damaged growing points will stop growing and will not produce a head. The visual symptoms of frost injury to the heads appear as bleached glumes (and can be confused with scab or take-all). Additionally, freeze damaged florets appeared to be lighter green in color than unaffected florets on the heads. Remember, you cannot detect damaged fields from the roadway; you will need to walk the field and inspect individual heads to see if there is any damage. After being slowed down by cold temperatures over the last 7-10 days, the wheat crop is now heading-out or flowering in some parts of the state – do not be deceived by the fact that plants still look short in some fields. Heading and flowering will continue over the next few weeks. 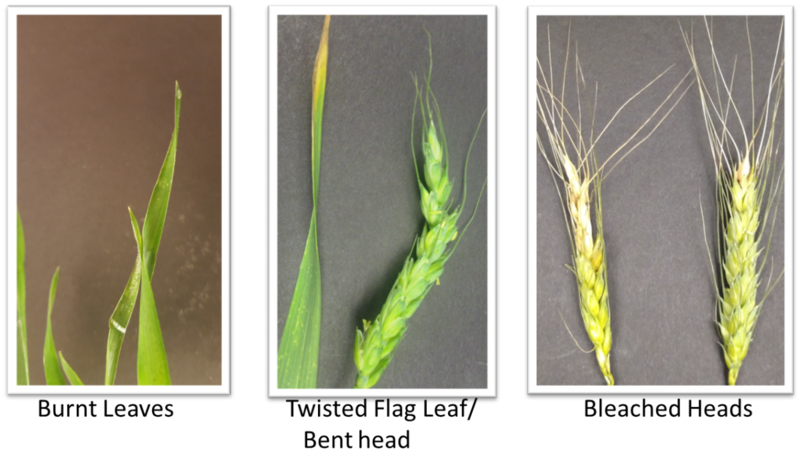 These are very important growth stages from the standpoint of disease management, since it is critical to maintain the health of the heads and the leaves during grain fill to enhance yield. Once the heads are completely out, it may take another 3-5 days, and sometimes longer if it’s cool, for it begin to flower. This stage is marked by the extrusion of anthers from the spikelets; the reason for which this process is also referred to as anthesis. The identification of this growth stage is very important for the management of Fusarium head blight (head scab) with fungicides. Note: When trying to identify flowering growth stages, based your assessment on the presence of fresh (brightly colored) anthers, since dried, discolored, and spent anthers may remain hanging from the spikes well after Feekes 10.5.3. This can be misleading. Fungicides are most effective against head scab and vomitoxin when applied during Flowering. Head scab and vomitoxin become our biggest concerns at this time of the wheat season. For wheat flowering today, May 8, the risk of scab is low across most of the state (the map is green), but moderate in parts of the west (yellow areas close to the Indiana border). The risk is also moderate-high in the northeast corner if the state, but the wheat in that region is not yet flowering. Several fields across Southern and Central Ohio will reach anthesis during this week. The risk will likely remain low if it stays cold, in spite of the rains, but continue to keep your eyes on the weather and the scab forecasting and alert systems over the next few weeks, and be prepared to apply a fungicide (Prosaro or Caramba at full label-recommended rates) at flowering if the risk increases. One of the requirements for the registration of XtendiMAx, Engenia, and FeXapan is the investigation of any non-performance (ineffective control) by the respective companies, which then has to be reported to the USEPA. The goal of this reporting is apparently to try to track the development of resistance as soon as it occurs in a few fields, which would then allow time to modify practices so that the rate of resistance in other fields is slowed. We encourage growers and consultants to take the time to scout for non-performance, within 14 days after application according to information from labels. Problems with control can be reported to the three companies via online sites or toll-free numbers as follows, or directly to company representatives. Problems with off-target movement from spray particle drift or vapor drift (volatility) can be reported to the three companies the same way. We would encourage growers experiencing these problems to contact the companies or their representatives, but unlike non-performance, they are not required to investigate and report these to the USEPA. Given that these problems are usually the result of not following label guidelines or appropriate application practices, the primary contact would be the Ohio Department of Agriculture. Contact the ODA Pesticide and Fertilizer Regulation Section at 614-728-6987. As a result of the warm winter and early spring, weed growth in no-till fields is ahead of schedule. Fields not treated with burndown herbicides last fall or during the earlier drier period this spring can have some large weeds at this point. Many fields need time to dry out following the most recent rains before they will tolerate traffic, which will allow weeds to get even larger and more challenging to kill. Large marestail can be especially problematic due to the combination of glyphosate and ALS resistance in most populations. Cool weather can reduce the activity of the herbicides that have activity on marestail. The standard “glyphosate + 2,4-D” burndown is not likely to control large marestail plants based on recent history, and increasing the 2,4-D rate or adding metribuzin won’t necessarily result in effective control of these plants either. The issue here is that 2,4-D is carrying the entire load with regard to control of emerged marestail, and it’s not effective enough to control large plants, even with the addition of metribuzin. While Sharpen is more effective than 2,4-D, a mixture of glyphosate plus Sharpen can also become more variable in effectiveness as marestail get larger. In no-till fields that have not yet been treated with herbicides, consider making changes to burndown programs to ensure complete control of large marestail prior to emergence of nonGMO, Roundup Ready, and LibertyLink soybeans. Postemergence application of glufosinate in LibertyLink soybeans is most effective on marestail plants that emerge after planting, not for control of plants that survived the burndown herbicide treatment. Suggestions follow. - Burndown treatments should contain at least two active ingredients with substantial activity on marestail. The most cost-effective of these still include 2,4-D, which will require a 7-day wait to plant. Examples: glyphosate + 2,4-D + either Sharpen or Zidua PRO; Gramoxone + 2,4-D; Glufosinate + 2,4-D. The inclusion of metribuzin is recommended for all of these mixtures, and should absolutely not be omitted for the mixtures of 2,4-D with Gramoxone or glufosinate. - where it’s not possible to wait to plant, choices can be less effective or more expensive. Best approaches here, ranked from most to least effective: 1) glufosinate + metribuzin + either Sharpen or Zidua PRO; 2) glufosinate + Sharpen or Zidua PRO; 3) Gramoxone + metribuzin + Sharpen or Zidua PRO. - Switching to a program that includes Sharpen can result in the need to modify the residual herbicides as well. Mixtures of Sharpen with residual products that contain flumioxazin (Valor etc), sulfentrazone (Authority), or fomesafen (Prefix, etc) must be applied at least 14 days before soybean planting. Waiting this long to plant may not work as we move later into May. Alternative residuals that can be used in mixtures with Sharpen, and applied anytime prior to soybean emergence include: Canopy Blend or Cloak DF + metribuzin; Matador + metribuzin; metolachlor/metribuzin premix products (Boundary etc). Total metribuzin rate for all of these should be the equivalent of 8 to 10 oz of metribuzin 75 DF (possibly less on sandy soils low in organic matter). - In fields planted with Xtend soybeans, there is obviously the option to use XtendiMax, Engenia, or FeXapan in the burndown, and then also as a postemergence follow up if necessary. Dicamba is generally more effective then 2,4-D on marestail, especially larger plants, and the combination of glyphosate plus dicamba may be effective enough in the burndown. We have observed reduced control of larger plants in mixtures or dicamba with residual products that contain flumioxazin (Valor etc) or sulfentrazone (Authority). Increasing the dicamba rate may reduce problems in these mixtures. - be sure to optimize spray parameters and adjuvants. Mixtures containing Sharpen and Zidua PRO should be applied with MSO. Gramoxone should be applied with COC. Gramoxone, glufosinate, and saflufenacil (Sharpen, Zidua) are contact herbicides, which require 15 to 20 gpa spray volumes and nozzles that optimize coverage. Check labels for specifics. This information is summarized in a short video, which can be found on our blog (u.osu.edu/osuweeds) or on our Youtube channel https://youtu.be/orhtPNcn9GU. We have also started a Facebook page for information disseminated by OSU specialist, “OSU Agronomy and Pest Management Specialists”, and the video is posted there as well. There was little progress made on corn planting last week due to persistent rains and saturated field conditions (https://www.nass.usda.gov/Statistics_by_State/Ohio/Publications/Crop_Progress_&_Condition/index.php). As of Sunday May 7, 46 percent of Ohio’s corn crop was planted - only 4% more than the previous week. Moreover, according to NASS estimates, only 12% of the crop has emerged. Weather forecasts indicate the possibility of more rain this week possibly continuing through the weekend. As prospects for a timely start to spring planting diminish, growers need to reassess their planting strategies and consider adjustments. Since delayed planting reduces the yield potential of corn, the foremost attention should be given to management practices that will expedite crop establishment. The following are some suggestions and guidelines to consider in dealing with a late planting season. Although the penalty for late planting is important, care should be taken to avoid tillage and planting operations when soil is wet. Yield reductions resulting from "mudding the seed in" are usually much greater than those resulting from a slight planting delay. Yields may be reduced somewhat this year due to delayed planting, but effects of soil compaction can reduce yield for several years to come. (Keep in mind that we typically don’t see significant yield reductions due to late planting until mid-May or even later in some years). If you originally planned to apply nitrogen pre-plant, consider alternatives so that planting is not further delayed when favorable planting conditions occur. Although application of anhydrous N is usually recommended prior to April 15 in order to minimize potential injury to emerging corn, anhydrous N may be applied as close as a week before planting (unless hot, dry weather is predicted). In late planting seasons associated with wet cool soil conditions, growers should consider side-dressing anhydrous N (or UAN liquid solutions) and applying a minimum of 30 lb/N broadcast or banded to stimulate early seedling growth. These approaches will allow greater time for planting. Similarly, crop requirements for P and K can often be met with starter applications placed in bands two inches to the side and two inches below the seed. Application of P and K is only necessary with the starter if they are deficient in the soil, and the greatest probability of yield response from P and K starter is in a no-till situation. Remember the longer our planting is delayed, the less beneficial a starter with P and K will be, because later planting dates typically have higher soil temperatures. Keep time expended on tillage passes and other preparatory operations to a minimum. The above work will provide minimal benefits if it results in further planting delays. No-till offers the best option for planting on time this year. Field seedbed preparation should be limited to leveling ruts that may have been left by the previous year’s harvest - disk or field cultivate very lightly to level. Most newer planters provide relatively good seed placement in "trashy" or crusted seedbeds. Don't worry about switching hybrid maturities unless planting is delayed to late May. If planting is possible before May 20 to 25, plant full season hybrids first to allow them to exploit the growing season more fully. Research in Ohio and other Corn Belt states generally indicates that earlier maturity hybrids lose less yield potential with late plantings than the later maturing, full season hybrids. Also remember that later May and June planting dates generally increase the possibility of damage from European corn borer (ECB) so planting ECB Bt hybrids is often beneficial. In delayed planting situations, use the optimal seeding rates for the yield potential of each field. Recommended seeding rates for early planting dates are often 5-10% higher than the desired harvest population because of the potential for greater seedling mortality. However, soil temperatures are usually warmer in late planted fields, and as a result germination and emergence should be more rapid and uniform. So, as planting is delayed, seeding rates may be lowered (decreased to 3% higher than the desired harvest population) in anticipation of a higher percentage of seedlings emerging. Adjust seeding depth according to soil conditions and monitor planting depth periodically during the planting operation and adjust for varying soil conditions. Planting depth recommendations for corn in Ohio are 1.5 to 2 inches deep to ensure adequate moisture uptake and seed-soil contact. Planting shallower than 1.5 inches is generally not recommended at any planting date or in any soil type. Deeper planting may be recommended as the season progresses and soils become warmer and drier. Join specialists in the field this summer to see hands on what insect and disease pressure is present. The specialists will help participants identify insects and diseases and then discuss management strategies. The series begins with a Pasture Walk on May 23 at 5:30 pm. The field borders the Ohio Caverns so an optional group tour of the Caverns has been set up at 4pm ($15). The rest of the crop walk schedule is listed below. The locations will be determined about a week or two ahead of time in order to find one that will display some of the issues that will be discussed. These will be in fields in Champaign County. May 23: Pastures with Bob Hendershot. Other topics include grazing BMPs, species selection and nutrient management. Optional Caverns Tour at 4pm ($15). Please RSVP for the Caverns tour. Pasture Walk will begin at 5:30 pm in a field next to the Caverns. June 1 or 14: Wheat Diseases with Dr. Pierce Paul. Location TBD. Start time 5pm. July 17: Soybean Diseases with Dr. Anne Dorrance. Location TBD. Start time 5pm. July 31: Soybean Insects with Dr. Kelley Tilmon. Location TBD. Start time 5pm. Aug 15: Corn Diseases with Dr. Pierce Paul. Location TBD. Start time 5pm. For questions or to RSVP call the Champaign County Extension Office at 937-484-1526 or email Douridas.9@osu.edu. Credits applied for include Certified Crop Advisors and Private and Commercial Pesticide Applicators. Details will be updated on the Events page of https://agcrops.osu.edu as they become available.